Jane and John Doe are your typical employee. I began meeting John and Jane nearly 40 years ago when I first began my working life. In fact back then I was John Doe. Since 1991 when I left the corporate world and began working with business owners/leaders of medium sized businesses and leaders in multinational organisations to help them improve performance, I have met 1000’s of Jane’s and John’s. Regardless of industry, country, product or service Jane and John Doe are everywhere. They are the majority of your employees. And they are stopping (albeit unwillingly) your business from being the standout it could be. Jane and John Doe are your average employee. They are neither actively engaged or disengaged. Each of these percentages staggered me. And guess what? Despite billions of dollars spent, and countless hours and tons of energy, nothing has really changed. Engagement surveys across the world still reveal the same kind of dismal results. What is going on is that in most organisation's Jane and John Doe are being overlooked. The future success of your business lies with how you see, treat and take care of Jane and John Doe. Jane and John, like every human being, have aspirations. In my experience the trouble is you don’t know what Jane and John’s aspirations are because most of the conversations you have with them, if you have conversations at all, are about your business and not about them as people. You need to have conversations about the personal and your business. 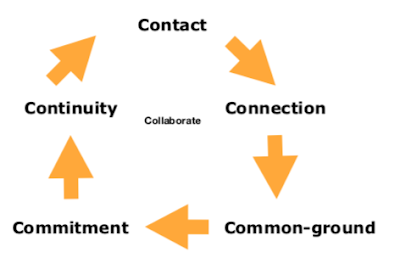 Most organisations look like this with most employees in the middle. Political elections are won and lost in the middle. Just ask Obama and Romney! You can win more in your business by moving the middle to the left and the right to the left or out the door. 5 actions you can take. 1. 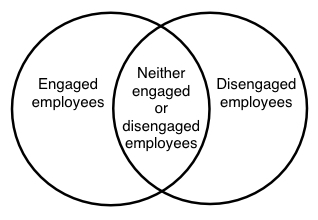 Truly get to know your employees who are neither engaged or disengaged. Find out what really matters to them and what they are passionate about. 2. Help your neither engaged or disengaged employees to identify their unique talents or gifts and work with them to create a one page 90 day action plan to better ultilise their talents or gifts to achieve what really matters to them. 3. At the same time help people to add to their one page 90 day action plan how they can better bring their unique talents or gifts to their work. 4. Teach people to have regular conversations with their team mates about their one page 90 day action plan and how to show appreciation to another when their plan is working and how to be more accountable when, for whatever reason, their plan isn’t followed. 5. Ensure that every 90 days people have a what’s worth celebrating and what could be better conversation with themselves and their team mates and then upgrade their one page personal and business action plan for the next 90 days and continue appreciation and accountability conversations. I realise the actions above may seem counter intuitive or even silly. My Enhancing Their Gifts System makes it simple for you to take the above 5 actions. If there is not significant performance improvement within 90 days of implementing the system I will give you your investment back no questions asked. What the system does like nothing else available on the planet is engage people in their hearts and minds for the right reasons, unlike most performance management systems that try to engage people in their minds for all the wrong reasons. See the key differences between the Enhancing Their Gifts System and the rest here and register for the next demonstration clinic or contact me to arrange a private clinic. I have been a pioneer in the development and effective use of one page personal and business action plans. What is truly unique about the Enhancing Their Gifts System is not the one page however. What is special is the journey before the one page is created and the powerful conversations that follow. It is a road less traveled. I promise you that taking it will make all the difference.